Welcome to need of the day! Breville BMO715BSS the Quick Roast Stainless Steel Microwave Oven. How do you combine the speed of a microwave with the crispiness of an oven? With the Quick Roast, the built-in chicken program automatically combines microwave, grill and convection for for brown and juicy roast chickens in half the time. So now you can use the added features of grill and convection to bake and brown food for added flavour. Convection Grill: The 1100 watt grill element browns and crisps food for added flavour and texture, while the 2300 watt convection element is for fast and even baking and roasting. QuickStart One-Touch Cooking: One touch, instant start button adds 30 second intervals and automatically microwaves at 100% power. Additional Features: Microwave, grill and convection can be used independently or in combination. Auto Cook Menus: 8 auto cook menus and reheat. Includes vegetables, fish, meat, chicken, potato, pizza, soup and oats. Weight or Timed Defrost: Dual defrost by weight or time. Automatically calcultates power level and time when defrosting by weight. When defrosting by time, power level is adjusted automatically. Speed Settings: 10 Power Levels. Voltage: 220 - 240 Volts. Construction: Stainless steel fascia and cavity. Door Mechanism: Stainless steel pull handle. Need of the day - luxury goods at bargain prices. NeedOfTheDay is an Australian owned and operated site designed with you in mind. Are you looking for a great bargain? Or a trendy outfit that would make heads turn not once but multiple times? Are you trying to find that perfect screen protector and case for your gadgets? Do you want to turn your little girl into a princess? Are you longing for that luxurious and premium hotel experience in your own home? Do you fancy setting a new fashion statement with the finest quality socks? Then NeedOfTheDay is the perfect one stop online shop for you! At NeedOfTheDay we bring everyday Australians the finest products from all around the world-at the best possible prices. Do you know what that means? We endeavour to place luxury and quality products within reach of ordinary Australian's without compromising other financial obligations. NeedOfTheDay engages accredited logistic partners to ensure that your goods are delivered without delay. So, If you are looking for a great bargain without having to compromise on quality then NeedOfTheDay is the site for you. NeedOfTheDay has something for each member of your family including. Our service can't be beaten and we promise that. WE PROMISE TO HANDLE AND DISPATCH YOUR ITEMS IN 3 HOURS. If you don't like it - return it - no questions asked. At NeedOfTheDay we value your business and will strive to deliver your ordered items to you efficiently and without delay. Our mission is to give you world class service. We will try our best to respond you within 24 hours. Best quality products at most competitive prices. 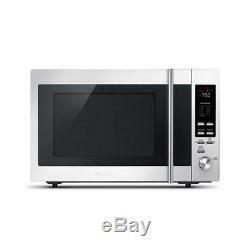 The item "Breville BMO715BSS the Quick Roast Stainless Steel Microwave Oven" is in sale since Saturday, March 24, 2018. This item is in the category "Home Appliances\Small Kitchen Appliances\Microwave Ovens". The seller is "needofthedayau" and is located in Melbourne, Victoria.